Intimus DIS 300/450 Disintegrator is ideal for data destruction. 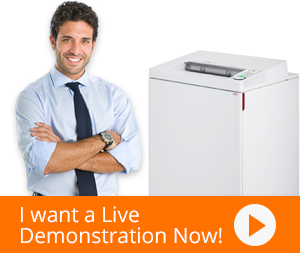 The shredder comes backed with several features that make it effective and competent. A unique feature of the shredder is that it has different security levels based on its screen mash diameter which can alternate from DIN level 3 till level 7. With a dual diagonal cut knife layout, its sturdy and robust blade can shred through staples, paper clips, floppy disks and even credit cards quite easily. It’s knives can also be re-sharpened several times allowing them to be highly durable. A large feed opening of 17 3/4”× 13 25/32” makes Intimus DIS 300/450 Disintegrator suitable for all standard computer formats. The shredder has been intended to be service friendly through the incorporation of an easy access milling chamber as well as a clearly arranged operating panel. This allows Intimus 300/450 Disintegrator to provide better-controlled operations and more ease to the user. The shredder also has a throughput with B40 of 360 kg/h. Lastly, the shredder also supports a solid sheet steel housing with evacuation from the hopper. All of these features have made Intimus DIS 300/450 Disintegrator the most primary choice of organizations across the globe as it has the capability of meeting the higher security requirements for government agencies etc.